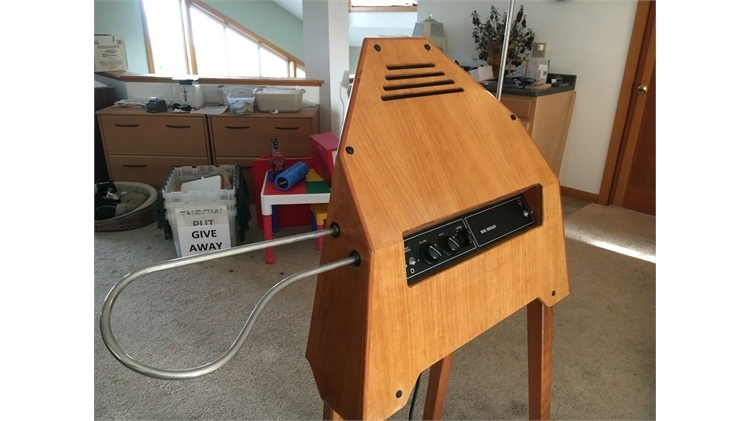 An extremely rare Big Briar Series 91-C theremin is currently for sale on eBay, and it appears to be in excellent condition! A bit of background... Before the current incarnation of Moog Music, Bob Moog's company was called Big Briar, Inc. In the early 90's, they produced a small run of 3 different variations of the Series 91 theremin: models A, B, and C. The "Model A" was a traditional podium-style cabinet. "Model B" was a U-shaped cabinet, reminiscent of the models built by Leon Theremin while in the Soviet Union. "Model C" was more of an artistic experiment, featuring crazy angles and a beautiful cherry cabinet. According to Steve Dunnington of Moog Music, only around 125 Series 91 theremins were made in all, and of those, the Model C made up the smallest percentage due to the complexity of building the cabinets. They were originally priced in the $2700-$2900 range, making this particular sale a great deal! This Series 91C is currently in Port Hadlock, WA and is part of an estate sale. Little else is currently known about its ownership history. Update: The listing sold within hours of this posting. Congratulations to the lucky new owner of this beautiful instrument!